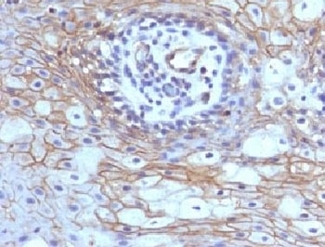 CD59 antibody LS-C391294 is an unconjugated mouse monoclonal antibody to human CD59. Validated for Flow, IF and IHC. Azide-free. Also available Unmodified or Ready-to-Use. CD59 antibody was raised against recombinant Full-length Human Protein. The applications listed have been tested for the unmodified form of this product. Other forms have not been tested. Reacts with human CD59, a 20kDa glycosyl phosphatidyl-inositol (GPI)-anchored cell surface protein. CD59 regulates complement-mediated cell lysis, and it is involved in lymphocyte signal transduction. This protein is a potent inhibitor of the complement membrane attack complex, whereby it binds complement C8 and/or C9 during the assembly of this complex, thereby inhibiting the incorporation of multiple copies of C9 into the complex, which is necessary for osmolytic pore formation. It inhibits formation of MAC, thus protecting cells from complement-mediated lysis. Genetic defects in GPI-anchor attachment, that cause a reduction or loss of CD59 and CD55 on erythrocytes produce the symptoms of the disease paroxysmal hemoglobinuria (PNH). This MAb is useful for study on GPI-anchored proteins, PNH and CD59 functions. CD59 is widely distributed on cells in all tissues. The expression of CD59 on erythrocytes is important for their survival. Optimal dilution of the CD59 antibody should be determined by the researcher. 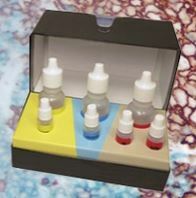 Staining of formalin-fixed tissues is enhanced by boiling tissue sections in 10mM Citrate buffer, pH 6.0, for 10-20 min followed by cooling at RT for 20 min. Formalin-fixed, paraffin-embedded human tonsil stained with CD59 antibody (MACIF/629). This image was taken for the unmodified form of this product. Other forms have not been tested. 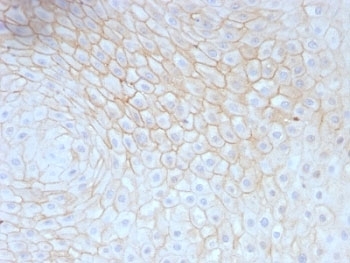 Formalin-fixed, paraffin-embedded human tongue stained with CD59 antibody (MACIF/629). This image was taken for the unmodified form of this product. Other forms have not been tested.